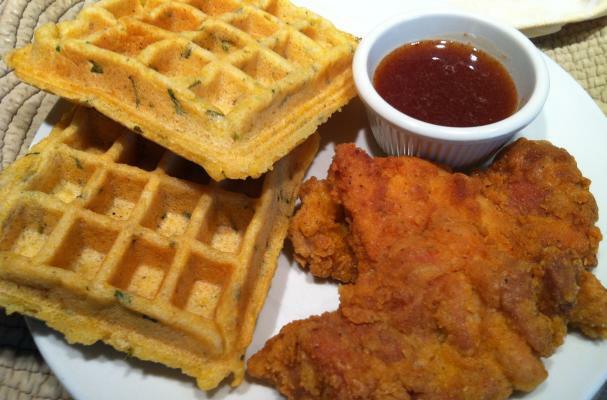 Foodista user Jessica Glick shares a recipe for her gluten-free fried chicken and cornbread waffles from her blog Jessica' Gluten Dairy Free Kitchen. This classic Southern dish is made with a twist. Instead of sweet waffles drizzled with maple syrup, these gluten-free cornbread waffles are studded with rosemary and served with a honey Tabasco sauce. This comforting meal is guaranteed to please everyone at the table. Place all the chicken on a baking sheet or cutting board, season both sides evenly with kosher salt, black pepper. In a shallow bowl scramble the eggs add a small pinch of salt, set aside. In another shallow bowl add the biscuit flour, paprika, and garlic powder. Set next to the eggs bowl. Place a large skillet set over medium high heat, when skillet is hot add oil. Meanwhile begin dredging only a few pieces of chicken (once the first batch is cooking then continue to dredge and flour, set aside). First dip the chicken into the egg then into the flour, gently pressing the chicken to have the flour stick to it. Note: I use one hand for egg dipping and the other for flour dipping to prevent clumps of egg white forming in the flour mix and on my hands. Test oil by dropping a little bit of flour, when it quickly sizzles, it’s ready for frying. Gently add each piece of chicken slowly, do not overcrowd the pan, otherwise, it will not get crispy. Cook on each side 4-5 minutes. Transfer to a cooling rack over a baking sheet or onto a plate. At this point I turn on my waffle maker (I have my waffle batter prepared and set aside before making my chicken) and wait a few minutes for it to get hot while I begin to dredge and cook my second batch of chicken. Gently and slowly put the remaining floured chicken into the pan. Again, cook for 4-5 minutes on each side. Note: When your oil is very hot before frying (350 degrees F) it will not have any oil drippings on your plate or baking sheet so a paper towel on the plate is not necessary. Follow instructions on the back of the cornbread mix. Once the ingredients on the cornbread mix have been blended (I use a hand held mixer for this recipe), add almond milk, and oil, mix to combine. Add the rosemary and chives, stir until just combined. When the waffle maker is hot, ladle the waffle batter into each waffle mold. Cook for 3 minutes (set a timer) or 3 minutes 30 seconds maximum. Note: More cooking time will result in a crispier waffle. Mix honey and tabasco sauce until combined. Transfer to individual condiment cups or a small bowl.